Posted February 24, 2017 by Robyn & filed under Artworks, Behind the scenes, General News, Stories from the Bushveld. This is an extremely special story, in the most personal sense. I’ve written occasional blogs about this piece throughout the painting process. For the current instalment, I’ve compiled them all together to form one complete story- so yes; it is a rather long and involved tale. However, if you take the time to read it, I feel confident that you will agree that the story behind this portrait is quite significant. A very real illustration of the motivation and inspiration behind the work that I produce. There’s more to it than simply giving you a better understanding of me, and what I deem to be “significant”. I like to think that this story also serves as a reminder that remarkable things can be achieved when the motive behind them is heart-felt and genuine. True, we all have very different ideas as to what classifies as “remarkable”, but this experience for me, as a whole, has been just that. The story of the painting that reconnected me to people and to a land that I feared I’d lost touch with forever. 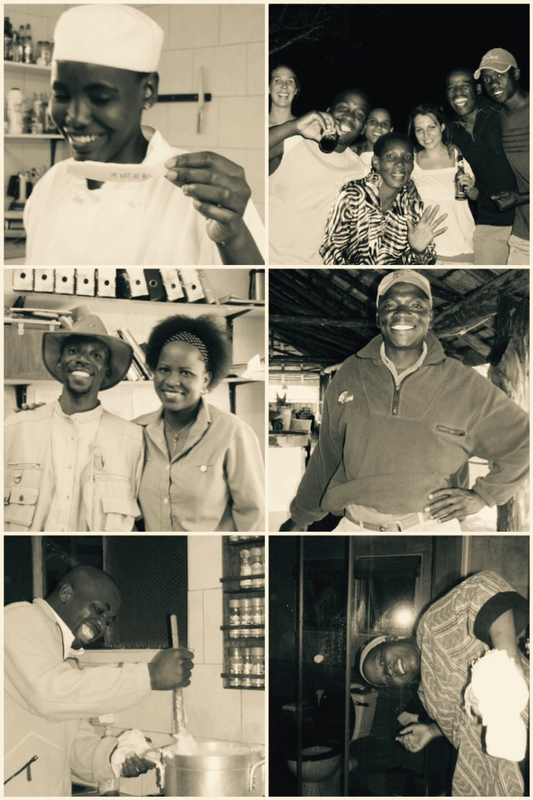 I first met Rhampo in 2007 when I was afforded the incredible opportunity to get some career/life experience working in an intimate 5 star safari lodge in Botswana’s Tuli block. Having recently matriculated, and having always been passionate about the bush, the opportunity was an absolute dream come true. A chance to experience the “wilder” side of life was of course an exciting prospect in itself. The way in which the journey ultimately widened my perceptions, and shaped my path in life, well that was rather unforeseen. Throughout my time at Nitani, I met incredible people who I grew to really value and look up to . Rampho was one of those people, in a very subtle, almost unintentional way. The majority of staff who worked at Nitani had done so for years. William Thipe Pilane, known to us as “Rampho” (or Rhampo as I’ve incorrectly spelled it for years) certainly knew the land like the back of his hand. Rampho was the grounds caretaker from 1960 until it was bought by Shane and Ade Pinchen in 1985, after which Rampho was employed at the lodge. Rampho was extremely hard working, sweeping the lodge walkways spotless each and every morning. Clearing the guest arrival point of every single Mopani leaf and seed pod that dared gather there in the hours between his attendance. He had very kind eyes. When he wasn’t working, he would sit quietly in the shade, atop an old paint bucket, observing his surroundings, watching over us with a soft smile on his face. I always found his eyes to be reflective of something pleasant, quiet laughter perhaps. He was a patient man, always encouraging my attempts to speak Setswana. He had a wonderful sense of humour too. We would often end up in flutters of laughter when I said something incorrectly in my efforts to converse daily pleasantries in his native tongue. Just too uh, “paint the full picture” –pardon the pun! Nitani was quite far from everywhere really. It was wild and charming, remote and captivating, completely evocative in its own special way. To me, it was paradise. The lodge grounds were completely un-fenced. 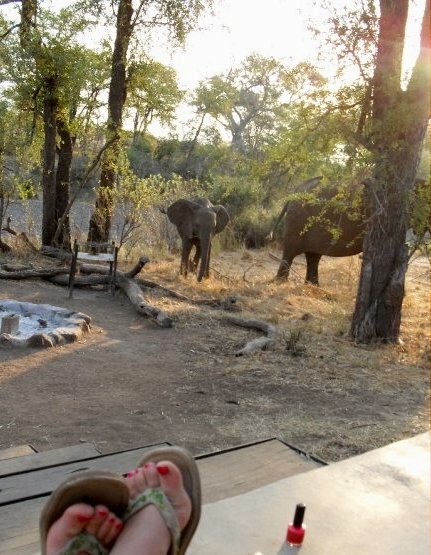 Whilst the guests enjoyed the comfort of stilted accommodation, our staff houses stood alone, quietly secluded, existing unobtrusively alongside the dry Majale riverbed. Encounters with elephant and hyena whilst walking to and from work were almost a daily certainly. 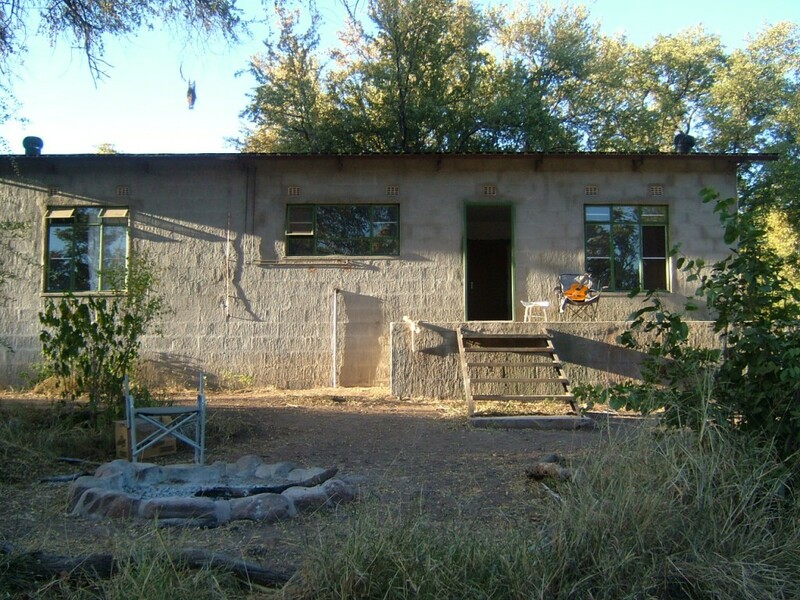 It didn’t take me long to develop strong friendships with the staff who lived and worked in the lodge grounds. 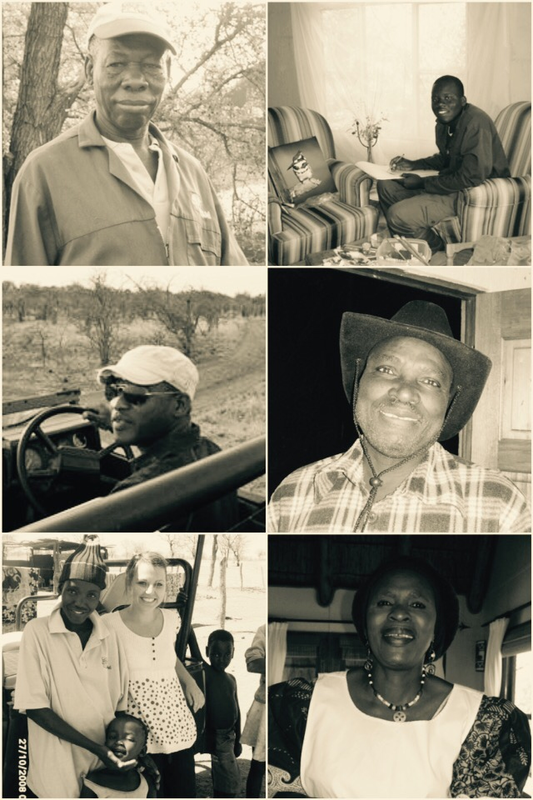 I found the Botswana people to be warm, charming, intelligent, interesting, hard-working and friendly. Being just 19 years old and rather far away from familiarity I immediately felt comfortable and at home with my new found friends. I became particularly close to a young lady by the name of Joyce, who was in fact Rampho’s niece. Ultimately, my time spent in Tuli was completely unforgettable, definitely most significant and I always get rather nostalgic when my mind wanders back there. By the time I returned home from Botswana I had developed a wonderful friendship with the Lodge owners too, Shane and Ade. The friendship made it slightly more bearable to revert back to my life in SA, knowing in the back of my mind that I could return to Tuli, whenever the land beckoned my soul on a level that required serious action to be taken. 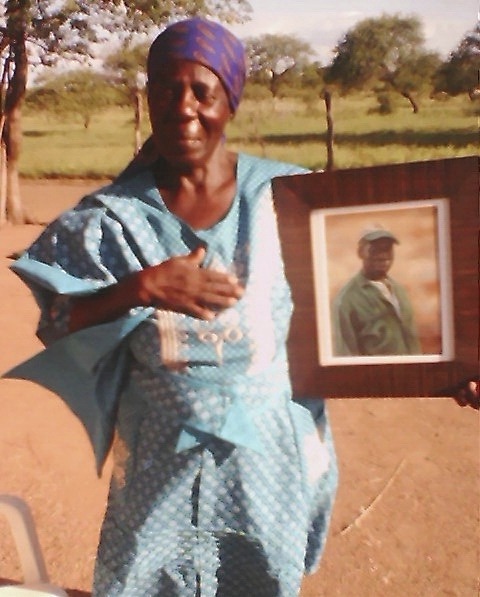 I last visited Tuli in 2009, by this stage Rampho had retired and was living happily with his wife and family in his home village near Semolale. 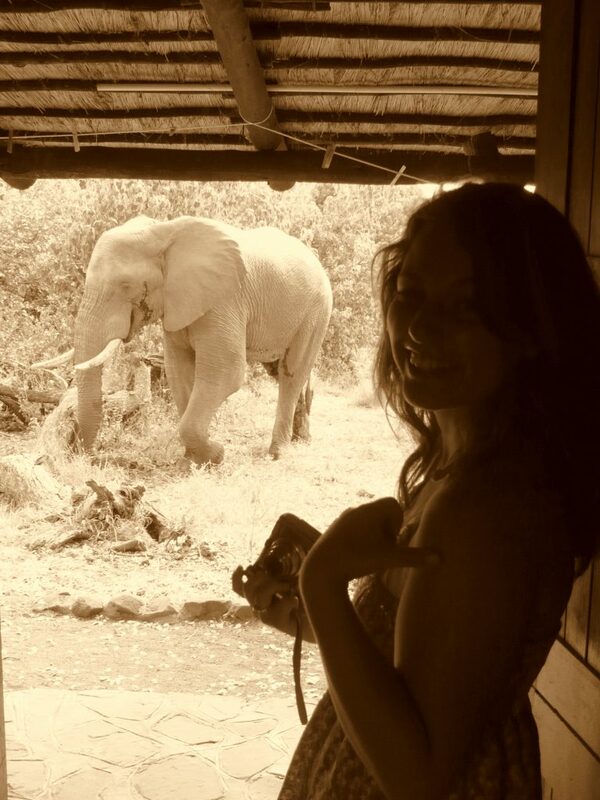 I’ll never forget arriving In Botswana for the first time. The staff members were extremely intrigued by my painting equipment and there were a few requests put forth throughout my stay for personal portraits to be done (full body, life-size of course). Needless to say that with my lack of painting experience, combined with the minimal materials and painting equipment I had managed to haul across the Limpopo River, those requests were never met. I took photographs of them instead, at random moments throughout day to day life. I got the photos developed during a leave stint in SA, bringing them back to my friends to put up on the walls of their homes. A small token that would hopefully serve as mutual reminder of friendship and the time we spent together .Little did I know that one of those photos would be the very thing that would preserve the ties of friendship along down the line. When I photographed Rhampo, it was a very simple process. As he was attending to his work, clearing the guest arrival point of ALL signs of Mopani tree litter (with the precision and thoroughness that only he could manner). I walked up to him and asked if I could take his photograph, holding out the rickety old camera that I had borrowed from my brother before leaving for Botswana. The camera was not rickety when my brother initially lent it to me. Only did it become that way after a troop of baboons “borrowed” it from my house. Taking a few snaps themselves before “hiding” it in the dry river bed. Allowing me the chance to test my tracking skills under pressure. Baboon shenanigans aside, Rhampo smiled softly and nodded in agreement. I snapped two quick shots, thanked him and we both went back to our respective daily activities. I love the subtlety that was captured the day I took the photograph because Rhampo was in fact an incredibly “subtle person”, in the purest, most discerning and dignified sense of the word. He was the most subtle yet extraordinarily effective human being. 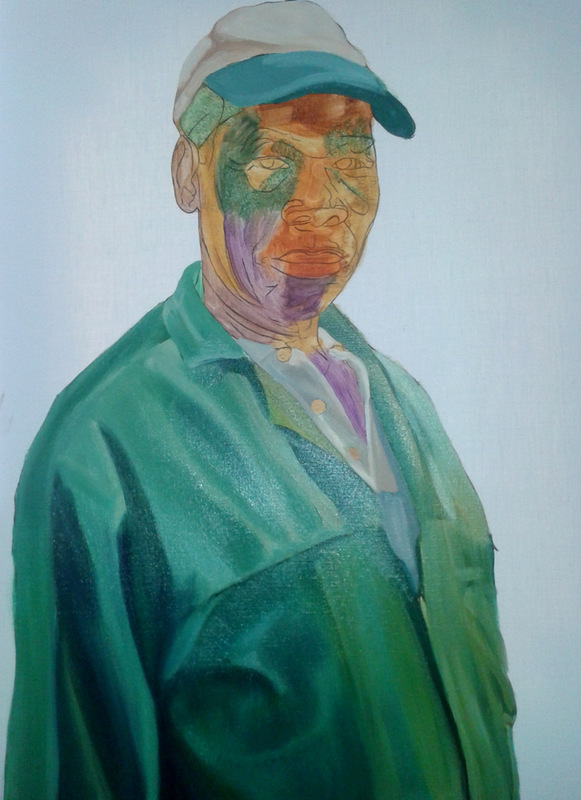 Painting a portrait of someone you know and respect is a privilege. Depending on the role the subject played in your life the experience can also be emotional, profound in the most personal way. There is just something about bringing to life human emotion on canvas (however subtle it may be) that is truly fulfilling. I loved every moment spent working on this portrait. 81 hours spread over +- 7 months – to give you an idea. Shortly after deciding to paint this piece I contacted Shane. I wanted to find out if there was any way of getting in touch with Rampho to inform him of my portrait plans. Astonishingly, I was told that he had passed away just three months before, peacefully in his sleep. I felt a sense of peace and comfort knowing the man Rampho was and knowing too the life he lead. 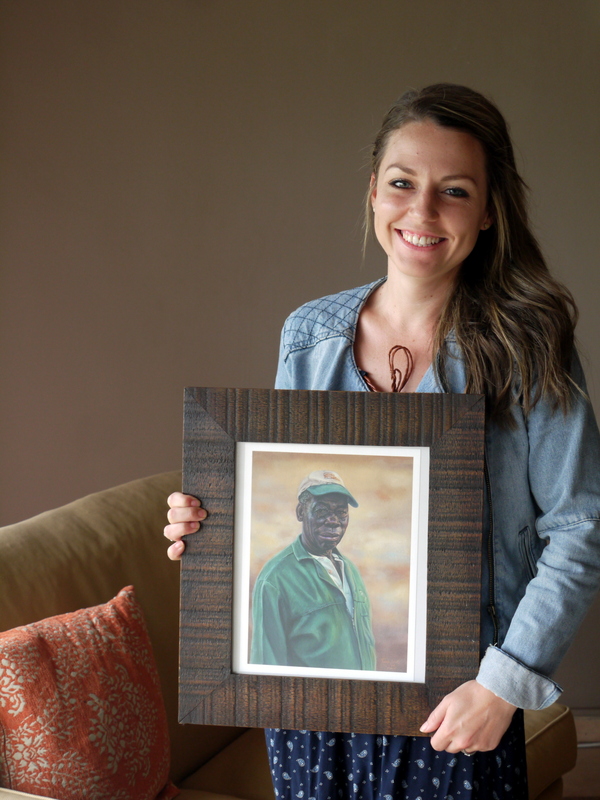 I was however, deeply saddened that I would never get the chance to present him with his portrait. I know my old friend would have been exceptionally proud to have had his portrait painted. I like to think that he would have been pleased with the finished product. I feel a sense of accomplishment knowing that I have completed at least one portrait from my time spent in Tuli. I displayed William’s portrait at the 2016 Art in the Park exhibition, putting up a small tribute to William alongside the painting. Portraits always get a lot of attention from exhibition goers but I was almost overwhelmed by the large number of people who came looking for me after having viewed the portrait, wanting to know more about William, or simply just to share their admiration of the finished piece. I was not expecting the portrait to sell and I was more than happy to bring William back home to my studio once the exhibition concluded. I have enjoyed having the portrait hanging on my wall ever since- until my mom asked if she could “borrow it” to grace the walls of her home for a while. As much as I was enjoying out “portrait share”, I still couldn’t shake the feeling that there was more to come for the portrait of Sir William. It was quite beautiful really, the way in which things somehow fell into place. If I were to focus on all the complexities behind the sale, it would be a rather long, twisty tale, I shall do my very best to simplify! After sending out my first newsletter towards the end of last year, I received a text message from a friend of mine. Tazz , the daughter of Shane (the founder or Nitani ) had received my newsletter , in which a picture of The Crest article featuring Rampho’s portrait was included. 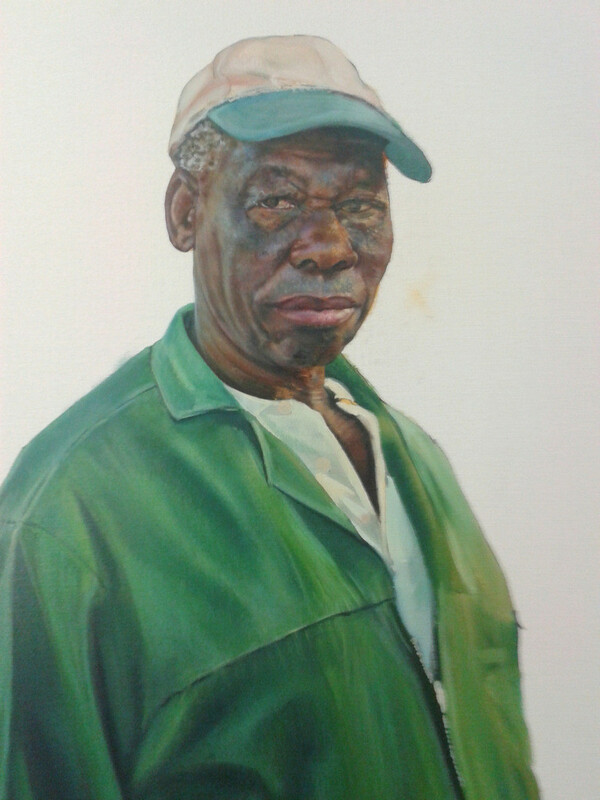 Being reminded of the portrait, Tazz then informed me that she thought she might suggest to Shane (who lives in Kokstad), that the original painting perhaps needed to find its way back to the lodge… Kokstad then sent word out to the Nitani shareholders (living in all corners of the world), and one Shareholder in particular, Michael Dawson from the UK, then decided to purchase the original as a donation to Nitani. It all happened quite quickly but when the enormity of what was happening finally sunk in, I couldn’t quite believe just how special the realisation was. Knowing that Rampho’s portrait was going “home”, reclaiming its rightful place in the heart of Tuli- that’s what true fulfilment feels like. Rampho’s portrait, displayed proudly at “Sir William’s”- the lodge bar that was named in Rampho’s honour. As mentioned previously, I have always had it in my heart that I wish to somehow get a print to William’s wife. I wasn’t too sure how I was going to achieve that as I had lost contact with most of the staff at the lodge. I wasn’t even sure of her name or where she lived (bear in mind that Nitani is very remote, with no phone lines etc.). Anyway, upon purchasing the portrait, the request was put forth by the shareholders that I consider doing a “closed-collection” edition of prints, whereby I produce 1 print for each of the shareholders. I happily agreed to the terms, under the condition that 1 extra print be included in the edition- the print that I was still hoping could somehow find its way back to William’s wife. Upon my suggestion, Shane told me that he loved the idea and that he actually knew where to find her, as she still lives at Rampho’s Cattle post, in a small village near Semolale. 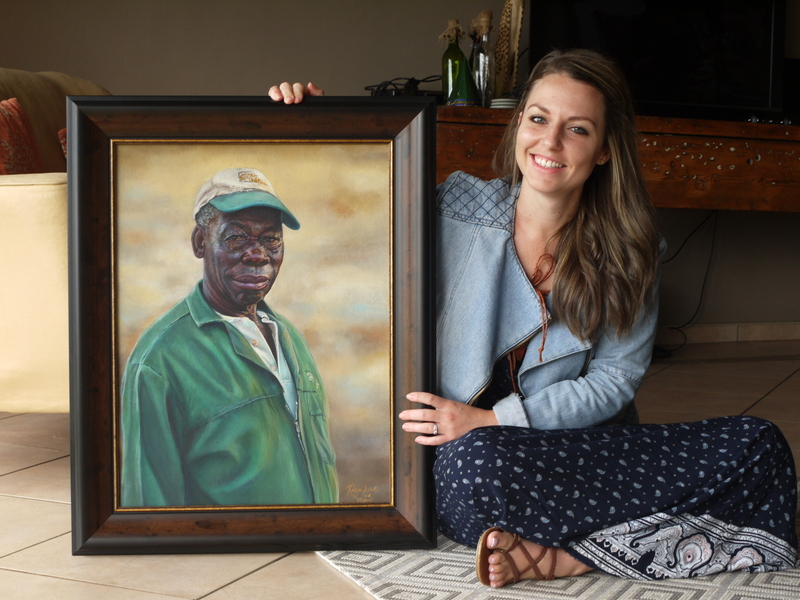 He then told me that he was going up to Botswana in a day or two’s time, and that ‘IF” I was able to get a print to him before his departure, he would deliver it to her himself! Needless to say, everything that has happened has made my heart so incredibly happy. Through sending the portrait back to the lodge, I have managed to re-establish contact with many of my old friends. There have been names popping up here and there on my Facebook Art page, text messages coming through, each and every one saying how happy they are to be in touch again. 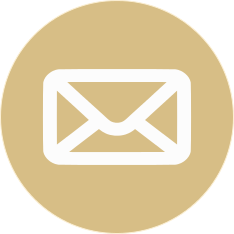 Furthermore, it has been most touching to have receive one or two message from members of William’s family. These are family members that I have not met before but who wanted to get in touch with me to say “job well done”. It was quite emotional, receiving a message earlier today from Rampho’s grandson, Kgomotso Pilane. He told me what a wonderful role model Rampho had been to him and then he simply said , “on behalf of the family I would like to thank you for the picture. That’s very kind of you.We really appreciate it”. born 1929, died 2015 aged 86. 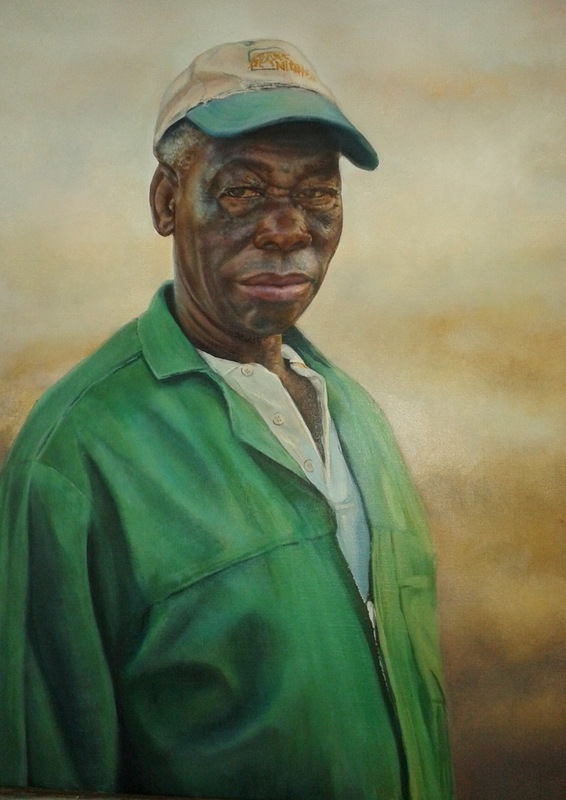 Rampho lived at his cattle post next to the Majali River, and was caretaker of the lodge grounds from 1965 until it was bought by the owners in 1985. 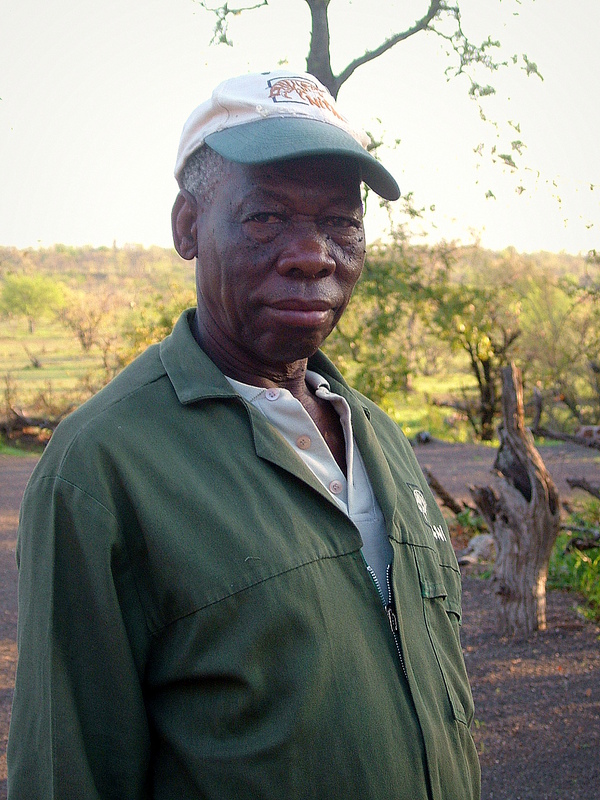 Rampho continued to work at the lodge as grounds manager even after his official retirement in 2000. 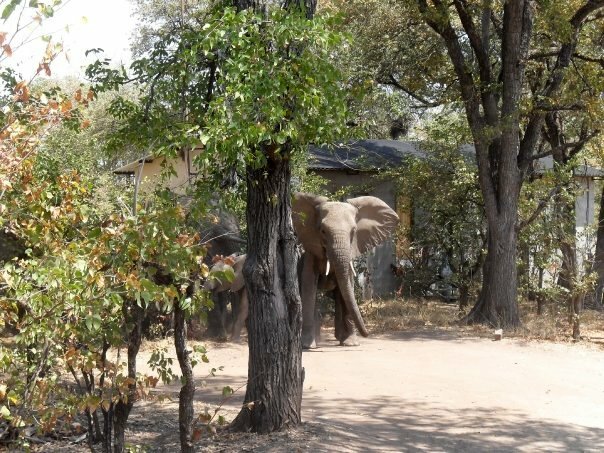 He was extremely hard working, sweeping the lodge walkways spotless each and every morning, clearing the car park of any Mopani leaf or seed pod that dared gather there in the hours between his attendance. Rampho was a kind and patient man. 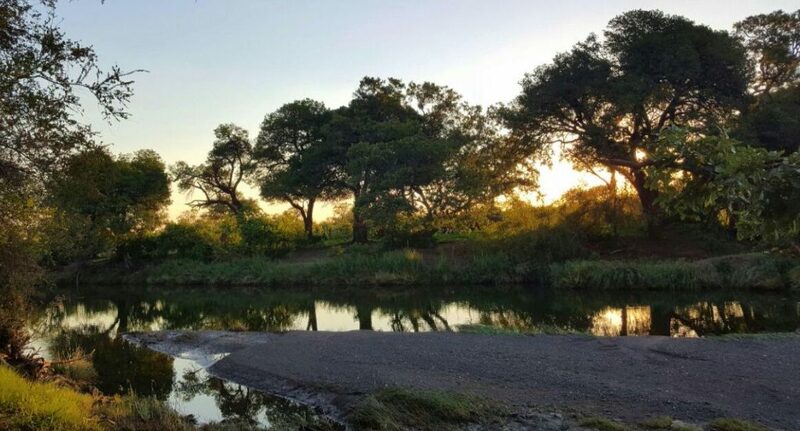 When the grounds were purchased in 1985 he enthusiastically taught the new owners all the Setswana names of the rivers on the grounds as well as the local history of the area. As an example, the river that runs into the Majali River on the eastern side of the lodge is called the Mataphamahaka, which means ‘the place where the vultures bath’. To this day, at the confluence of the Majali and the Mataphamahaka, the vultures perform their daily bathing ritual. Rhampo was a true gentleman. He was exceptionally dignified, softly spoken, wise and well respected by those who worked with him, myself included. In fact, when the lodge was built, it was decided to name the bar after him, as a sign of respect. The bar was christened “Sir Williams”. Rampho served on the local Kgotla council as well as the Zionist council as a respected Elder, from 2000 to his passing in 2015. 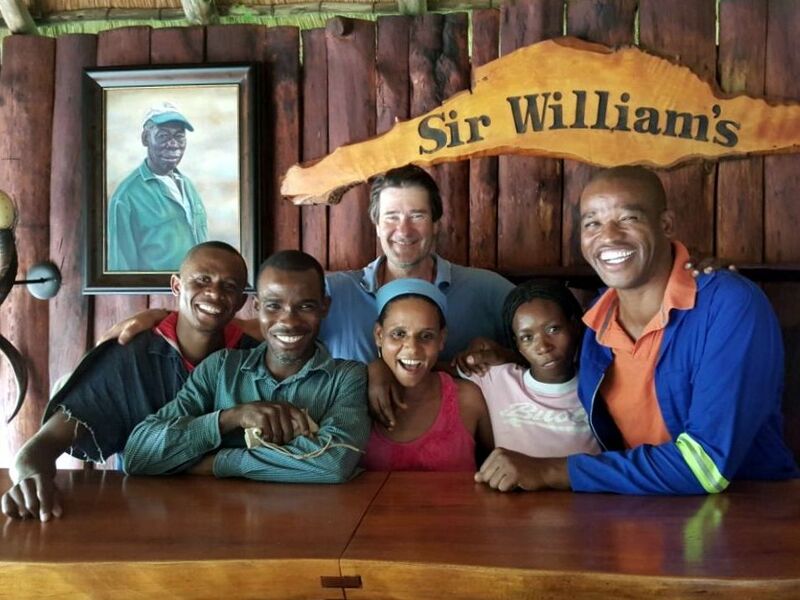 William Thipe Pilane will be remembered for his regal bearing, consideration and kindness to every human he came into contact with… an example of how we should live our brief time on earth. 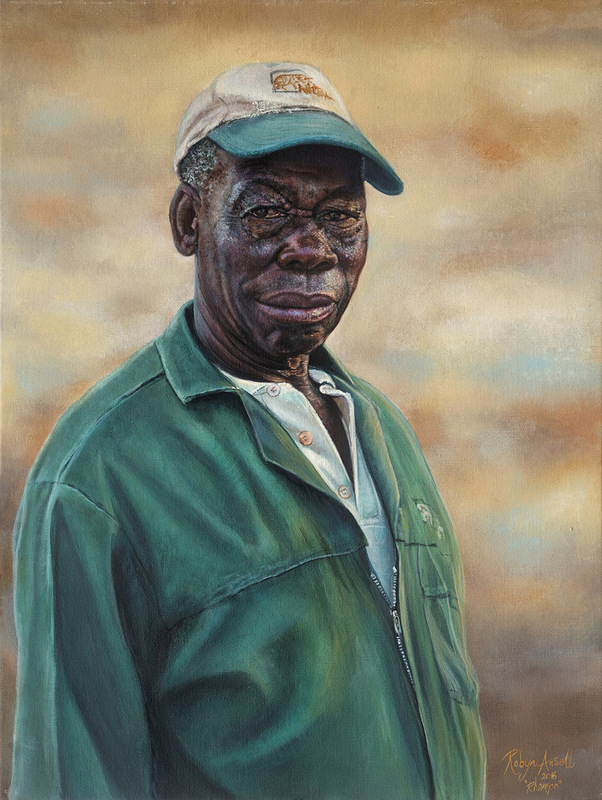 What a privilege it has been to paint this portrait, it is, after all, the perfect reminder of the most special journey, and the most wonderful old man who showed me what it truly meant to take pride in the work that you do. A very moving story, thank you! Lovely story of humanity and respect. Africa is truly a remarkable place to live in.